Zoey is a female bengal tiger. She is the sister of Bombay. Zoey is a ball of energy! She is super fast and loves to jump! Although Zoey is small in size she loves to pick on her brother. You will always see them playing around together. Zoey is usually the instigator of these playful romps. Liska is a female bengal tiger. She is a retired show animal from Wild Adventures Theme Park. Liska loves to stalk almost anything. Raja and Liska were raised up together. She is very playful and is Raja's best friend. Liska is full of life and is an awesome greeter when new people come to see her! 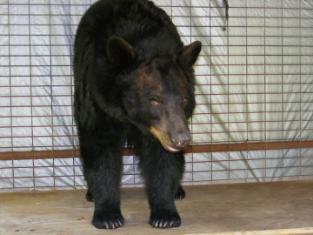 Jazzy is a female black bear. Jazzy was also a surplus animal from Okefenokee Swamp Park. Jazzy is such a character. She loves to climb and is very observant. She is tiny and petite but can hold her own when it comes to getting attention. Jazzy also loves a sticky peanut butter and jelly sandwich! 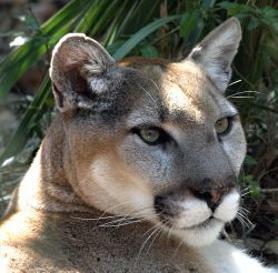 Lexie is a female cougar. She is the sister of Takota. Lexie has previously had problems with one of her kidneys. She is now on a special diet to prevent future problems. Lexie is a happy girl! She can always be heard purring. Vinny is a red, green and blue macaw. Likes to call to the ladies, "hey girlfriend", and loves to talk and talk and loves lots of attention. Bombay is a male bengal tiger. He is the brother of Zoey. Bombay and Zoey came from a private breeder in Florida. They were used in photo booths as cubs and soon became too large. Needing a permanent place to call home, Chris took them in. Bombay is sly, mischievious, and can be a trouble maker! Raja is a male white bengal tiger. He is a retired show animals from Wild Adventures Theme Park. 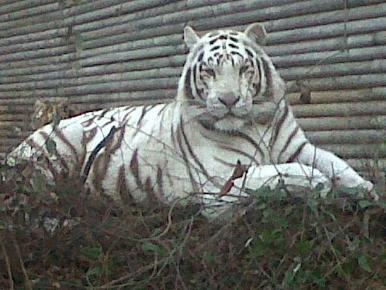 Raja is the face of Tiger Stripes and he is used in our logo. Raja is very goofey but oh so very sweet! He loves the water but loves food even more!!! Raja is always good for a laugh and will brighten up anybody's day. Honey is a female black bear. Honey was a surplus animal from Okefenokee Swamp in Waycross, GA. She now has a permanent place to call home at Tiger Stripes. Honey has a very special bond and trust with Chris. She loves a good scratch on the back. Her favorite treat is Peeps!! Takota is a male cougar. He is the brother of Lexie. Takota and Lexie are both retired show animals from Wild Adventures. Takota is shy and tries to stay out of the spotlight. He loves to roll around in fresh shavings! Balto is a male North American Timberwolf. Balto is a retired show animal from Wild Adventures. He is full of life and always wanting to play. He loves splashing through the water and jumping for his red ball. He always welcomes Chris with a howl when he comes home for the day. Sami is a female Blue and Gold Macaw. Sami loves to talk and she will always say "Bye" when you leave. She also loves Rock n Roll music! She loves to dance for you if you play a good old rock song for her.